Domesday Book records a church at Flintham, and St Augustine’s has stood as a landmark in the parish since Norman times. It is a cruciform building of grey limestone, and once contained a chapel dedicated to St Lawrence. 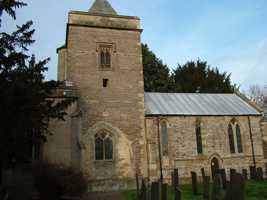 The church was given to Welbeck Abbey in the reign of King John. When Welbeck Abbey was dissolved, King Henry VIII gave the rectory and patronage and a considerable estate in Flintham to Trinity College, Cambridge. Subsequently these came into the ownership of the Hildyard family. In 1828 the church was largely rebuilt, having become ruinous. The nave and south aisle were replaced by the present nave built of Mansfield stone. The transepts were removed and the intention may have been to pull down the whole church. However the squire’s death put an end to his intentions and the medieval tower and chancel survived. The tower has ‘herringbone’ stonework, characteristic here of early Norman work. There are four bells, the oldest dating back to 1613 then 1616 and two from 1718.